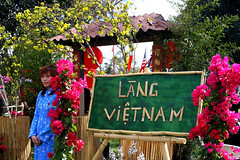 Tết Nguyên Đán, commonly known as Tết, is the most important holiday in Vietnam. It is the Vietnamese New Year which is based on the lunisolar calendar. Tết is celebrated from the first day of the first month of the lunisolar calendar (around late January or early February) until at least the third day. Many Vietnamese prepare for Tết by cooking special holiday foods and cleaning the house. On Tết, Vietnamese visit their families and temples, forget about the troubles of the past year and hope for a better upcoming year. Tết traditionally marks the coming of Spring, so Spring is sometimes used interchangeably with Tết in Vietnamese. TET Festival celebrates Tết and features three days of entertainment including lion dance, fashion shows, Miss Vietnam of San Diego, and Taiko Drum.